Great design inspiration is all around us. Sometimes the best examples are so common that we see them all the time without a second thought. The cars we drive, the advertisements in our mailbox, the cover art on that new album you just downloaded, all of these are teaching their own little design lessons and if we would but listen, we just might learn something. Today’s subject is playing cards. At least one pack can be found in almost every home in America, which means they’re a perfect example of ubiquitous design that we take for granted. We’ll take a fresh look at why they’re so perfectly designed and learn a little history along the way. Playing cards have been around in some form or another dating all the way back to 9th century China. By the 14th Century, they were making their way around Europe. There were two primary design patterns popular in Europe at this time: Parisian (popular in France) and Rouennais (popular in England), the latter of these having a great deal of influence on the card designs that most of us know today. The four card suits that we are familiar with, hearts, diamonds, clubs and spades, were created by the French. The original concept of suits came from the Italo-Spansish deck, which contained cups, coins, clubs and swords. The simple French suits were much easier and cheaper to manufacture because simple stamps could be used for the numbered cards instead of the traditional woodcut method. Only the court cards in the French deck required woodcut illustrations. Already we’re seeing good design in action. The graphics were specifically created with affordable replication in mind. Have you ever really thought about how well designed playing cards are? You might scoff at this notion but I’m quite serious, they’re a shining example of the marriage of aesthetics and usability into a coherent and nearly perfect product. As an exercise in how to learn from the amazing design all around you, try to clear your mind of everything you know about cards and attempt to look at them for the first time. Playing cards are one of the best examples of symmetry in design that you will ever find. This expert wielding of a basic design principle serves two purposes. First, it makes the cards quite attractive. Our brains love symmetry and are attracted to it both in nature and in art. More importantly perhaps, the symmetry in a deck of cards serves a functional purpose: you can’t hold a card upside down. It seems a small thing, but functionally the game goes infinitely smoother if cards can be immediately picked up and placed into a player’s hand regardless of orientation. This is simple enough with the numbered cards, but the symmetry persists (albeit a reversed symmetry) into the “court” cards, which modern players commonly refer to as face cards. Court cards were originally created as full length character illustrations, the symmetry was added as an improvement around the middle of the 19th century. Playing card designers went well beyond symmetry in consideration of how to maximize the functionality of the designs. There are quite a few design characteristics worth mentioning. Notice how the numbered cards display their suits, not with a single illustration but by repeating the icon to match the card’s value. Originally, this allowed the exclusion of typography, these days it serves more as a bonus visual indicator. Eventually though numbers (and letters) were added in the form of corner indices, which made their way into American decks in 1875. This design tweak allowed players to hold the cards closer together in a single hand rather than dispersing them over two hands; a major usability boost! Before this, the Jack card was more commonly referred to as a “Knave” or “Knight.” This presented a problem with the indices though as a “K” would appear on both the Knight and the Knave. At this point, the card was officially changed to a Jack to prevent confusion. Once again, we see the designer keeping the user’s best interest in mind. As playing cards evolved, the originally generic royal figures took on specific personalities. Popular historic royal figures were chosen and ascribed to each court card. The image above shows the kings, David, Charles, Julius Caesar and Alexander the Great. Similarly, the queens of spades, hearts diamonds and clubs are, respectively, Pallas, Judith, Rachel and Argine. In the same order of suits, the Jacks/Knaves are Ogier the Dane, La Hire, Hector and Judas Maccabeus (or Lancelot). Read more about this here. The names were occasionally printed on the old cards, but today these personalities aren’t really considered, standardized or used in any way. The designs on the court cards hold some secrets as well. Notice how the King of Hearts is the only king without a mustache, and he appears to be killing himself! Some speculate that the latter of these has to do with the uncertainty surrounding the death of Charlemagne. Also notice how the King of Diamonds is the only king with an axe instead of a sword. One very likely story sums up all this mystery in a single, simple solution. Supposedly, after numerous copies, the integrity of the original artwork greatly declined. This lead to the vanishing of the King of Heart’s mustache and the other half of the axe which was traditionally slung over his shoulder, which would’ve resulted in a clear pattern: black kings carrying swords and red kings carrying axes. The other court cards are shown with in a more front-facing fashion, typically still looking left or right but showing both eyes. The one-eyed cards are attributed special significance in certain games. It’s also interesting to note that only four court cards, all of which are black, are looking to the right. The other eight cards look to the left. Why is the Ace of Spades given special significance? It used to be the case that Kings were the cards with the highest value in the deck, but from the 15th century on, the Ace, commonly the lowest valued card, became more important. Then under King James I of England, a law was passed requiring an insignia on the Ace of Spades as proof that the required taxes had been paid. This led to fairly lavish embellishments of company logos on only the Ace of Spades, which pursues to this day. Around 1860, even the Ace was dethroned as the highest trump in some games as the Joker came into being. “Joker” could be a derivative of “Jucker”, which is German for “Euchre” a game utilizing this now famous card. I’ve barely scratched the surface of interesting card facts. Here’s a list of sources for the information above, each is loaded with a ton of great history so be sure to check them out. Grab a Free Set of Vector Cards! Most of the images in this post were built using a free set of vector cards made available by Inkscape. A huge thanks to Chris Aguilar for the time and effort he spent on these in addition to making them available for download. Be sure to grab the free download! The point of this article is to get you to think about the normal every day objects around you from a designer’s perspective. 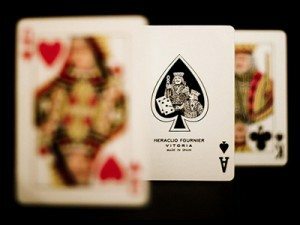 Who knew there was so much rich history and logic surrounding why playing cards look the way they do? As you become aware of interesting facts about how much design goes into silly little things that no one ever notices, you’ll find yourself wanting to put forth that extra effort to really refine your designs and put forth your best effort, regardless of the credit you’ll receive for doing so. Know any more fun facts about playing cards? Leave a comment below and let us know! Photo Credits: Adrià Ariste Santacreu, Nancy Ellis and Steven Depolo.